A dominant performance by Brad Keselowski and Martinsville (Va.) Speedway on Sunday ended with the driver holding off Chase Elliott and Kyle Busch for the win of the STP 500. 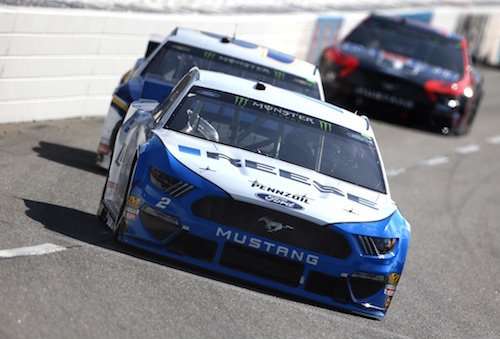 The win was Keselowski’s second Monster Energy NASCAR Cup Series win of 2019, six races into the season, and his second-career victory at Martinsville. Elliott finished second, and Busch was third. Busch had gotten off pit road ahead of Elliott for second during the seventh and final caution of the race that came out for Ross Chastain on lap 445. But on lap 458, Elliott retook the spot. Ryan Blaney and Denny Hamlin rounded out the top-five. Only three drivers led in the 500-lap race — Keselowski, Elliott and Keselowski’s Team Penske teammate Joey Logano. Elliott was the only driver to pass Keselowksi for the lead, either on the track or on pit road. He passed the eventual winner for the lead on lap 324. To that point, Keselowski had led all but the first five laps of the race. Keselowski, though, took his second and final lead of the race when he beat Elliott out of the pits during a lap-371 caution for Matt Tifft. “He (Elliott) was really strong, but he passed me there with about 200 to go, and I watched him and studied him and kind of broke it down and knew what I had to do to hold him off with that fast of a car and we were able to pull it off that last run with the Reese/Draw Tite Ford,” Keselowski said. After starting the 500-lap race in the third position, Keselowski took second from Aric Almirola on lap five and passed pole sitter Logano on lap six. Keselowski’s dominance included stage wins on laps 130 and 260. Elliott ran second to Keselowski for most of his time up front. After Hamlin moved into second by lap 14, Elliott took the second position to Keselowski by beating Hamlin out of the pits during the first caution of the race that came out for Michael McDowell on lap 65. Hamlin took second, briefly, again on a restart that followed a caution on lap 146 for Chastain’s rear axle, but on lap 173, Elliott retook the position. After running inside the top-five throughout the first half of the race, Hamlin was penalized for an uncontrolled tire on pit road during the caution at the end of the second stage. 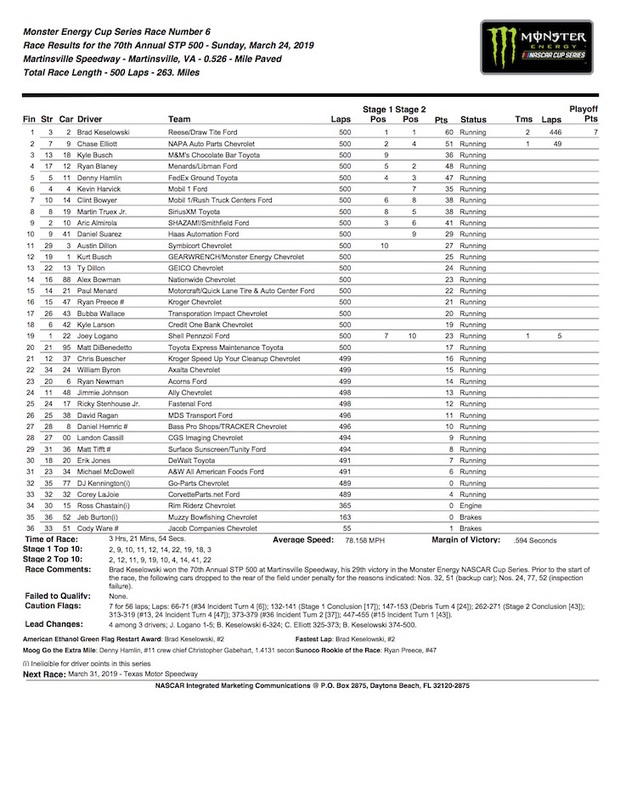 Clint Bowyer also received a pit-road penalty after running in the top-five, getting nabbed for speeding during the fifth caution of the race that came as a result of a William Byron spin on lap 312. Bowyer was nabbed for speeding for a second time during a lap-371 caution for Matt Tifft. Before taking the lead from Keselowski, Elliott also briefly lost second to Ryan Blaney, doing so on lap 242. Elliott fell back to fourth by the end of the second stage, but he was second off of pit road, again, to reclaim the position second to Keselowski. Finishing sixth through 10th were Kevin Harvick, Bowyer, Martin Truex Jr., Almirola and Suarez.